Wang’s Compound PicturesTraditional Chinese residences reflect the national culture, the sub-culture of a specific region and that of the ethnic group within it. The traditional domestic architecture of China has five major styles. As well as their respective features, traditional residences tend to conform to their environment and to become integrated with it. They are expected to blend with the surrounding rivers and mountains, thus complimenting but never spoiling the natural beauty. Our ancestors made use of local materials and took the natural factors into consideration whenever they built a house. The Si he yuan in northern China features a thick roof and walls and a wide courtyard to draw in maximum sunlight while ventilation is a prime feature of the diao jiao lou in the much warmer tropical climate of southern China. The Si he yuan in Beijing reflects the formal royal ambiance with its symmetrical style while garden-residences such as the famous Garden of the Master of the Nets in Suzhou, Jiangsu Province, gives priority to a harmonious blend with nature. 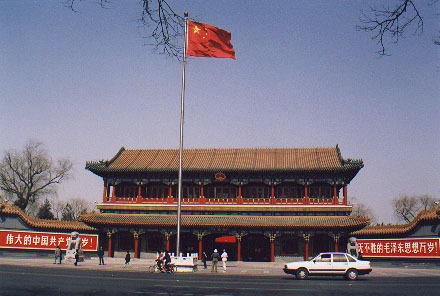 Prince Gong’s Mansion in Beijing is the world’s largest Si he yuan. Si He Yuan vary substantially in different locations. For details, please refer to: Beijing’s Hutong and Courtyard , Qiao’s Compound and Wang’s Compound in Pingyao, and Dang Village in Hancheng around Xian of Shaanxi Province. In calligraphy, the Chinese characters with a roof-like component relate to various houses. For example, with a pig, it is a home; with a cow, it is a prison; with a combination of two mouths it means ‘many houses’ – it is palace. Such characters combined with that for ‘ woman’ imply peace and safety. The logic behind this is based on two layers of meaning. Firstly, when a woman sits peacefully at home, it means there is no war. Secondly, when they lived in simple caves in open air, our ancestors faced the hazards of bad weather, wild animals and hostile tribes. By building houses, they were better protected, thus there was safety. Chinese folk residence appears in different forms. Around Suzhou in Jiangsu Province, there are many well preserved old towns such as Luzhi Town, Tongli Town and Zhouzhuang. The peaceful atmosphere in these towns attracts numerous visitors to come for relaxation and refreshment. The unique ethnic residences are really eye openers. In Guizhou Province, Langde Miao Ethnic Minority Village is a fascinating place to discover the unique Miao’s builing – “Diaojiaolou” (stilt-houses). Visit these beautiful places, you will know more about the colorful Chinese architecture. China, one of the countries that can boast of an ancient civilization, has a long and mysterious history – almost 5,000 years of it! Like most other great civilizations of the world, China can trace her culture back to a blend of small original tribes which have expanded till they became the great country we have today. It is recorded that Yuanmou man is the oldest hominoid in China and the oldest dynasty is Xia Dynasty. From the long history of China, there emerge many eminent people that have contributed a lot to the development of the whole country and to the enrichment of her history. Among them, there are emperors like Li Shimin (emperor Taizong of the Tang), philosophers like Confucius, great patriotic poets like Qu Yuan and so on. Chinese society has progressed through five major stages – Primitive Society, Slave Society, Feudal Society, Semi-feudal and Semi-colonial Society, and Socialist Society. The rise and fall of the great dynasties forms a thread that runs through Chinese history, almost from the beginning. Since the founding of the People’s Republic of China on October 1st, 1949, China has become a socialist society and become stronger and stronger. China is an amazing cultural treasure of the world situated in eastern Asia. Its natural wealth, five millennia of history, and an old continuous civilization, place China as a great travel destination. Numerous historical monuments scattered across the vast territory are vestiges of the ancient Chinese culture. These include: the Great Wall, the Forbidden City, X’ian’s Terracotta Army and Tiananmen Square. The vast land of this country also hosts various natural landscapes, such as the Three Gorges of the Yangtze River, the Silk Road, the Tibet or Hainan Island. Distinct cities feature distinct panorama and cultural background in China. Beijing is the capital city and a beautiful cultural center. It is host of the Olympics this year. Shanghai is largest city and the major business center with many commercial opportunities. Nanjing and Suzhou are historical places. Guangzhou is a modern prosperous city and Guilin is a paradise location. There are more than nine cities in China that should be visited. In the world, China is the most populous country, over 1.3 billion population. China is also the third largest country in terms of area, it has an area of 9.6 million square kilometres. Economists think that China will be the most world economy powerful within 20 years. Because of its large population, rapidly growing economy, extensive research and development investments, China is often considered as an emerging superpower. Finally, China has more than 5,000 years of alive history. For these reasons, traveling to China is like traveling to another world. The rapid Chinese’s growth has improved the tourist infrastructure. China has become one of the most visited countries in the World. Nearly 50 million tourists travel to China every year. If you’re visiting Asia, don’t miss out of the wealth and traditions of China. The countries fascinating history jostles with the urban cities of Shanghai and Beijing to create the perfect culture clash to explore on a visit to China with plenty of cheap flights to choose from. Los Angeles, CA (July 29, 2009) – The Chinese government often has the clout and muscle to prevent Hollywood films from being released in Asia, and can even discourage films from having an extended release in the West if they are perceived to threaten Chinese policy. Films starring such big name stars as Richard Gere and Sharon Stone were boycotted by China after the actors expressed support for the Tibet Independence Movement. After Disney released Kundun, Martin Scorsese’s 1997 feature film about the Dalai Lama, the studio incurred the wrath of the Chinese government, and Disney films were banned for an indefinite period of time. Recently, after a theatrical documentary film about the Dalai Lama and narrated by Harrison Ford entitled Dalai Lama Renaissance (www.DalaiLamaFilm.com) was released in theaters in Taiwan this summer and received front page positive press in the Chinese language Taiwanese newspapers, the Chinese government took keen notice. The People’s Daily, a daily newspaper and media arm of the Central Committee of the Communist Party of China, quickly and sharply criticized Dalai Lama Renaissance in an article in its online edition. The fact that the Chinese Communist Party’s main media organization has chosen to criticize the film may be a defensive reaction to the very positive press that Dalai Lama Renaissance received in the Chinese language media in Taiwan, where it premiered in front of sold-out audiences on June 1. And it may be an attempt to counteract any effect on readers in mainland China, who often have access to Chinese language news from Taiwan. Ironically, the Chinese Communist Party may feel most threatened by the idea brought up in the film regarding economic sanctions against China from the West. But despite this being a near unanimous suggestion by the Westerners in a scene in Dalai Lama Renaissance, the Dalai Lama discouraged the proposal. The People’s Daily also tries to discredit the producer-director of the film, Khashyar Darvich. In its article, the newspaper claims that the director is a “follower” of the Dalai Lama, and supports this assertion by referring to an interview where Darvich mentioned that he produced the film party for the opportunity to spend time with the exiled Tibetan leader. Despite the Chinese Communist Party’s attempt to discredit the film, Producer-Director Khashyar Darvich states that his production company, Wakan Films, has just signed an agreement to release Dalai Lama Renaissance unofficially into China itself, under the radar of the Chinese Government. For more information on Dalai Lama Renaissance, go to www.DalaiLamaFilm.com. Note: This is an UNOFFICIAL site providing information regarding the Chinese Government and related topics. All the information published in this page is collected from both official and unofficial sources. All the content in this page is for your informational purpose only. Question: if local government is out of control in spending tax payers’ money? China’s civil servants exam attracts 1.3 mln applicants – More than 1.3 million people have been accepted to sit China’s 2011 national service examination to select government officials after online registration closed late Sunday. They included 327,000 applicants competing for posts in central government and provincial-level organizations, said a statement on the website of the State Administration of Civil Service (SACS). Of those, 191,000, or 58.4 percent, had at least two years experience working in “grassroots” positions, said the statement. Another 794,000 were for vacancies at institutions of county-level or below, with 57.2 percent of them new college graduates. Some 168,000 more applicants were awaiting for results from recruiting bodies who would decide by 6 p.m. Tuesday whether they were qualified to sit the exam. The written test of the 2011 national civil service examination is to be held on Dec. 5 in major cities across China. The annual nationwide test, sat by 927,000 people last year, continues to be seen as a route to a stable job and enviable benefits in China, where every year 6 million college graduates join the labor force. The central government plans to recruit more than 16,000 public servants next year, 1,000 more than in 2010. In a move to reform the civil service exam, the government has decided to offer more vacancies to applicants with at least two years of grassroots experience and to reserve vacancies for college graduates with experience as village officials, as well as workers and farmers. Among this year’s qualified applicants, just 171 are workers and farmers running for reserved vacancies in customs, state taxation and railway police at county-level or below. News: China adds government department for charity activities.